I had some time to color and craft this weekend and got a few cards done, this first one that I'm sharing is using an image from Whimsie Doodle, it's in the freebie section, so if you want to grab it, you can find it HERE! I used the sketch from Sugar Pea Designs and a tag from my stash that I've had FOREVER! Love using up my supplies! I added the sentiment , the Merry Christmas is washi tape, added some ribbon, twine, faux stitching and that's about it! I love the clean and simple sketch and usually tend to keep my cards simple as well. 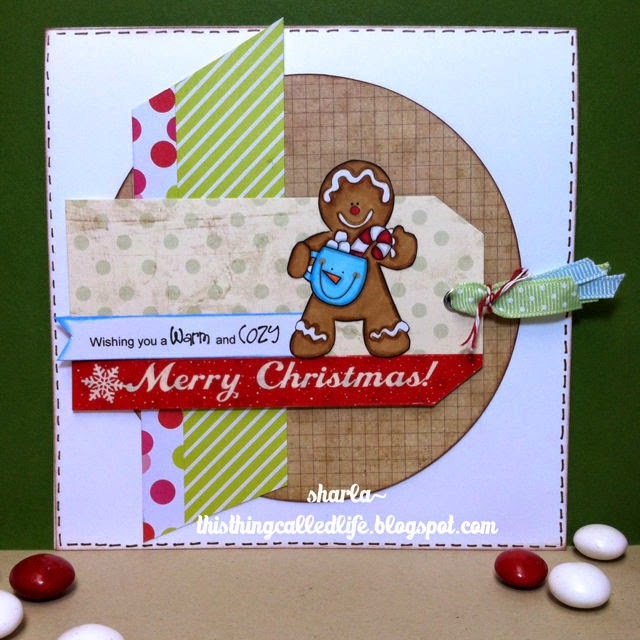 Love your cute gingerbread man, and you executed the sketch beautifully, Sharla! Thanks for sharing your card with us at the Simon Says Stamp Wednesday challenge! Cheery and happy design, Sharla! I love the contrast of image with the pattern paper! Thanks so much for playing Simon Says Stamp Wednesday “Winter Inspiration” Challenge! Wish you a very Merry Christmas and all the best in 2015! I absolutely love this card! So stinkin cute!